ORLANDO, FLA (February 25, 2013) — As part of its Nautique Cares program, employees from Nautique and the Orlando Watersports Complex (OWC) joined Team Nautique professional athletes for two days last week volunteering at a Habitat for Humanity project in Central Florida. On the first day the team worked together finishing the framing of the complex. The group consisted of a Nautique employees and Nautique team athletes Rhoni Barton Bischoff, Zack Worden, Danny Harf, Shawn Watson, Shaun Murray, Bob Soven, JD Webb, Mike Dowdy, Emily Copeland Durham and Raimi Merritt. The second day of volunteers included Nautique and Orlando Watersports Complex employees who spent their time installing weather proof wrap on the outside walls of the of the complex. 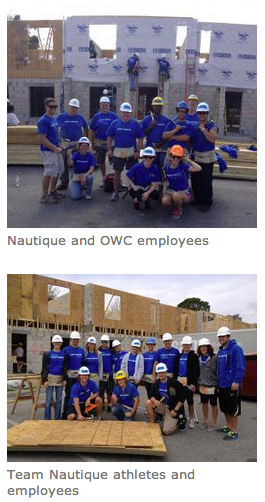 “Our team truly enjoys being involved with Habitat for Humanity as part of our Nautique Cares program,” stated Correct Craft President/CEO, Bill Yeargin. “Last year we had the opportunity to hand the keys to a new homeowner of a home Correct Craft funded and our employees helped build. We intend to do that again this year,” Yeargin added. To read Bill Yeargin’s blog regarding Nautique employees and athletes volunteering as part of the Nautique Cares program, please click here. Habitat for Humanity of Greater Orlando Area is a not-for-profit, ecumenical, Christian organization dedicated to transforming the lives of low-income, hard-working families through the American dream of home ownership. Rated a four-star charity by Charity Navigator, Habitat Orlando works together with local sponsors, donors and volunteers to build communities and build families throughout Central Florida. To learn more about Habitat Orlando or to make a donation, call (407) 648-4567 or visit www.habitat-orlando.org.